"This is a very flavorful Indian rice pudding. It's the best rice pudding I've ever had, and very easy to make!" Bring the coconut milk, milk and sugar to a boil in a large saucepan. Add Basmati rice, and simmer over low heat until the mixture thickens and the rice is tender, about 20 minutes. Stir in the raisins, cardamom and rose water, and cook for a few more minutes. Ladle into serving bowls, and garnish with almonds and pistachios. 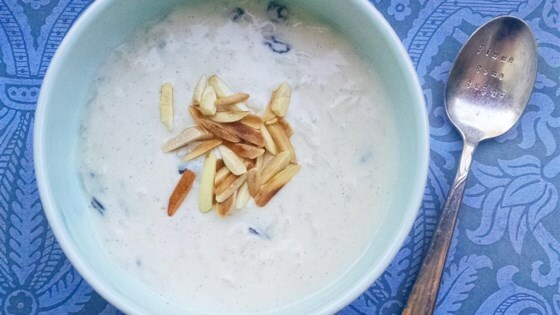 kheer is supposed to be more liquid-y than traditional rice puddings! It's not meant to feel like a log sitting in your stomach.